Our museum combines two previous Natchitoches museums, the Louisiana Sports Hall of Fame and the Old Courthouse Museum. The Louisiana Sports Hall of Fame celebrates accomplishments by Louisiana athletes, coaches and sports stars, while the Northwest Louisiana History Museum celebrates the region's culture and history, all in a dazzling museum complex in historic downtown Natchitoches. 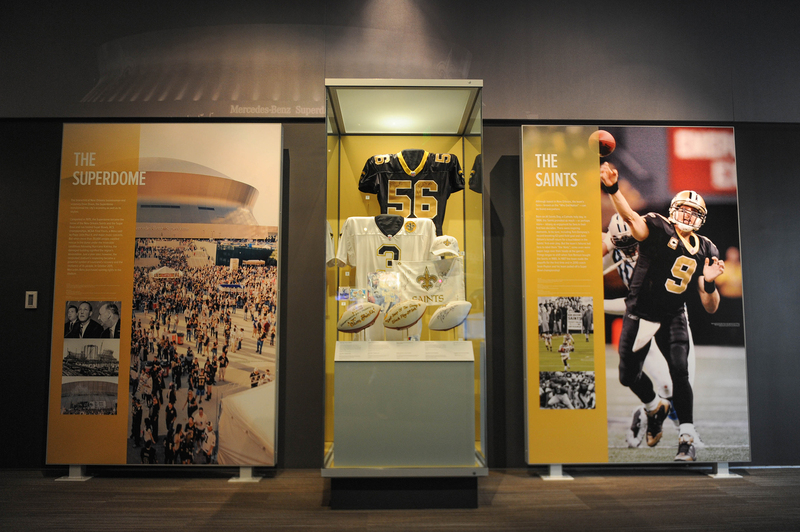 The Hall of Fame’s exhibits and interactive media trace the history of Louisiana sports and highlight the importance of sports to life in Louisiana. High-definition videos capture in-game drama and excitement, and touch-screens reveal sports stars’ life stories, career stats and colorful quotes. Some inductees are household names, such as Archie Manning, Willis Reed, Shaquille O’Neal and Chanda Rubin, but others hold equally important spots in the state’s sporting pantheon. New Orleans-born Audrey “Mickey” Patterson, for example, was the first African-American woman to win an Olympic medal. The Hall of Fame includes the USA jersey she wore when she won the bronze medal in the 200-meter dash at the 1948 games in London. Pete Maravich’s scrapbook of his years as one of the greatest basketball players to step onto a court, a Super Bowl XLIV commemorative football signed by all 53 New Orleans Saints after their 2010 victory and the fastest car in the world in 1963—a souped-up Ford Thunderbird—are just a few of the artifacts that make the Louisiana Sports Hall of Fame Museum in Natchitoches an up-close, personal and unforgettable fan experience. The Northwest Louisiana History Museum in Natchitoches brings 3,000 years of history forward to the unique cultural traditions that survive and thrive in the region today. The museum tells the story of how diverse groups of people—Caddo Indians, French and Spanish settlers, free and enslaved Africans and rural southern whites—created the region’s distinctive culture. With displays of artifacts dating from the 1700s, this museum celebrates the explorers, artists, writers, entrepreneurs and human rights leaders who embodied northwest Louisiana’s resilient spirit. Exhibits focus on seven major themes. Living Traditions, for example, explores present-day handcrafts, cuisine, social customs and flourishing subcultures, such as the Cane River Creole community of Isle Brevelle, whose origins began in colonial Natchitoches. The museum also proudly highlights Clementine Hunter, the internationally renowned folk artist, with 12 of her original artworks on display—including 10 paintings about life on Melrose Plantation. Admission includes access to all exhibitions. In partnership with the Louisiana Sports Writers Association and the City of Natchitoches, The Louisiana State Museum is proud to present this family-friendly attraction to the public. This museum is wheelchair accessible. Parking for the museum can be found on Front Street, along the Riverbank and Rue Ducournau. Additional public parking is located at the Natchitoches Event Center and Utility Service Center lots on Second Street. Get even more information here or on facebook. Trahan Architects of Baton Rouge designed the museum’s unique structure. The louvered copper exterior is reminiscent of the shutters of plantation homes, and the linear, earth-colored cladding is inspired by plowed fields. The interior is designed to resemble the flow of Cane River Lake, with curved walls echoing the natural cut of a river. The museum was named the Top Architecture Project in the World in 2013 by Azure magazine, beating other major projects in London and Paris, and has won a number of other architectural accolades.